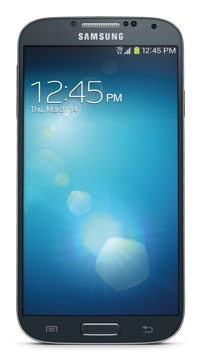 There was an unusually specific leak from Samsung last month, showing a relatively accelerated schedule for updates on the Galaxy S4, S III, and Note II on all four major American carriers. That isn't much comfort for those customers on US Cellular, since the #5 carrier wasn't quite important enough to be included in the leak. 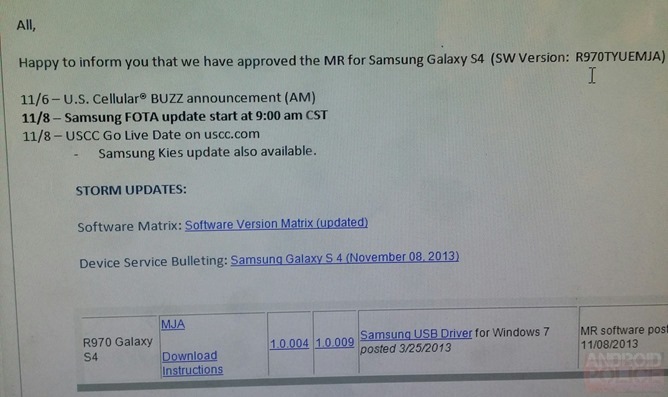 But now there's a new leak in town, helpfully provided by an anonymous tipster, showing that the US Cellular Galaxy S4 will be updated on Friday the 8th. That's the Android 4.3 update, which adds Galaxy Gear support and a ton of new TouchWiz features on top of all the additions to the latest Android Jelly Bean build. Samsung has been shipping this one out pretty quickly after the Galaxy Note 3 went on sale, probably to expand support for the Gear smartwatch to as many potential customers as possible. Whatever the motivations, it means that all major US carrier versions of the S4, S III, and Note II should be running Jelly Bean 4.3 by the end of the year. The leak is an internal US Cellular document, citing the R970TYURMJA software version for the carrier's S4 (model number R970). The clipped page also indicates that there will be an update to Samsung's Kies software, and it includes a link to the Samsung USB driver, so it's possible that the new update may not go out over-the-air. This is a bit of a long shot, since the previous Samsung updates on US Cellular were all OTA. Of course nothing's official until it's official, but we're reasonably sure that the update will begin on time.